Encouraged by NSERC’s response to explain the reasons behind the drop in the numbers of their graduate scholarships and postdoctoral fellowships, we decided to push our luck and inquire for the reasons behind the substantial decline in the budgets of almost all “Evaluation Groups” (EG) of the Discovery Grants Program. NSERC data for the total amounts awarded in all EG’s for individual discovery grants shows the following changes between 2006 and 2011. There are now 12 Evaluation Groups (EG) sharing this budget. Each one of them represents a discipline or a combination of “neighboring” ones. The budget of each EG varies from year to year, but since most discovery grants are awarded for 5 years, the budget of an EG is essentially the sum of the yearly budgets in five consecutive years. To have a reasonable idea about the change in a given EG budget, one therefore needs to compare budgets after a full five-year cycle, e.g., compare the grants awarded in 2011 to those of 2006, which was the year when most of the 2011 applicants got their last grant. One complicating factor for such a comparison is that NSERC had in the meantime restructured its classification for the various disciplines it serves, by combining the 23 Grant Selection Committees (GSC) which were used prior to 2009, into 12 Evaluation Groups. For example, the 3 GSCs for Pure & Applied Math (A), Pure & Applied Math (B) and Statistics, were combined into a single EG (Math & Stats 1508). Also, the new EG for “Chemistry”, combines the two older GSCs, one for “Inorganic & organic Chemistry” and another for “Analytic & Physical Chemistry”. So how could one compare the 2006 budget of a given discipline to its 2011 budget? Well, we did the most “linear” thing, by first trying to guess which of the old GSCs combined to form a modern EG, then by adding the 2006 budgets of these GSCs and finally by comparing this sum to the 2011 budget of that EG. 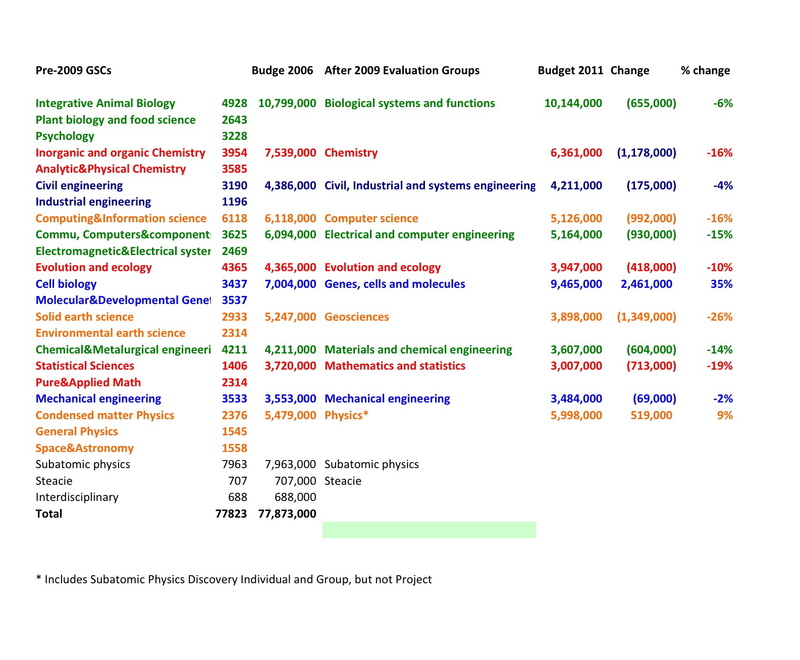 For example, the 2006 budget for the “Physics EG” has been taken to be the sum of the budgets of the 3 GSCs (Condensed Matter Physics, General Physics, and Space & Astronomy). On the other hand, the old GSC for Mechanical Engineering remained untouched as an EG. At the end of the day, we ended up with the following extremely surprising set of data. Essentially all but one discipline saw their budgets decline, some of them dramatically. Here is a table (and follow the color to trace the evolution of a given discipline). Now, we do know that the story is muddied further by the emergence of new programs whose budgets are somewhat linked to the Discovery Grant program, such as “the Accelerator Grants”. And since we’re at it, we may as well learn a bit more not just about the budgeting for such grants (is it new money or was it siphoned out of the EGs budgets? ), but also about their selection process which, in addition of producing mystifying results, remains a mystery. The data cited above comes from Table 28 of NSERC’s Facts and Figures. To interpret these figures properly, one needs to consider that the dollar figures include not just individual and team Discovery Grants, but also funding for EWR Steacie Memorial Fellowships and subatomic physics grants. Due to the nature of the grants and the dynamics of the subatomic physics community, the latter two have fluctuating cash flows from year to year, sometimes dramatically so. For example, in 2009, these elements of NSERC’s discovery research funding totaled about $17.4 million, while in 2010 they accounted for $6.4 million. Table 7 of the Facts and Figures (http://www.nserc-crsng.gc.ca/_doc/FactsFigures-TableauxDetailles/2009-2010Tables_e.pdf) provides a better picture of individual Discovery Grants funding by breaking down funding levels by program in more detail and over a longer time frame. Table 43 provides a more detailed breakdown by Evaluation Group. NSERC plans to publish the 2010-2011 version of Facts and Figures in the fall. This is accompanied by a note that the number of applications for the DG program is up to 3,900. Those of us who were cut off in previous years are not impressed that the odds are stacked against us even more by the decision to give more money to fewer people.